Does the BMW 2 Series Have a Pre-Collision Alert System? Back in the “good-old-days,” when cars were constructed of heavy steel throughout and drivers were expected to keep their eyes on the road even when tired, there were no pre-collision safety features. 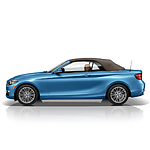 Today, such safety features are available, and included in such cars as the BMW 2 Series, as standard equipment. With the power and agility of the BMW 2 Series, comes a necessary inclusion of added safety components. Every vehicle in the BMW 2 Series comes standard with a pre-collision warning system, collision avoidance system, a lane departure warning system, and a drowsy driver warning system. The system is always active and especially valuable when driving on the busy streets of Portland. These pre-collision systems are intended to keep you and your passengers safe. If you notice any interruption of your smooth driving experience with no apparent danger sighted, come to BMW of Portland for an in-depth analysis.